I want to tell you about a bow hunt that went horribly wrong due to my own excitement "real hunter’s stupidity?". I feel I am fortunate to be alive to tell the story today. 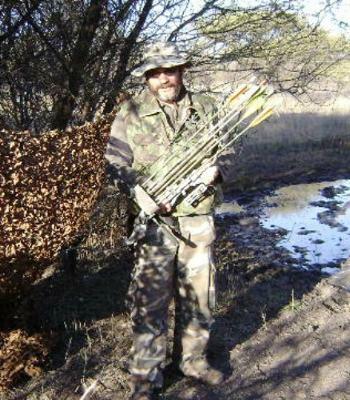 At that time I was still new and inexperienced at this antelope bow hunting business, although by then I’d already taken a couple of warthogs, one blue ape, guinea fowl, spring hare and of all things, even a puff adder! I used an older 60 pound Jennings bow with aluminium arrows and razor-sharp 125gr broad heads. So when the opportunity came to hunt an Impala ram on my good friend's 5000 ha Bushveld farm, I thought it was a piece of cake, as I was a ‘real bow hunter’ now and ready to step into this bow hunting game! With hindsight I must admit that sometimes there is a very fine line in the bush as in life? between over confidence and a blundering idiot! Mr. Murphy and his Law accompanied me that weekend and subsequently, nearly everything that could go wrong,did. Work kept me later than planned; the Jeep got a flat tire on the way and I even forgot my binoculars at home as well. To make a long story short, it was nearly sunset when I was shown the elevated ‘hide’ deep in the bush, near a cattle water trough, from where I was to hunt. In the dusk it looked perfect to me, although my friend warned me that the old blind had not been used for quite sometime. Even better, I thought to myself: Well, as you know. ‘Real bow hunters’ do it the hard way. Before sun-up the next morning, I started walking the approximately 3 km through the star studded Bushveld bush to the water trough, in order not to frighten any unsuspecting Impala ram that wanted to use that watering spot early on. Yes, you guessed it, after a few 100m, I got totally lost, as it was still too dark to recognize my reference point, a distant kopje. In those days, where I come from, ’real hunters’ didn’t use silly little gadgets like a compass or a GPS - only ‘inexperienced city slickers‘ used them. We ‘experts’ just instinctively ‘know' the direction from all our bush experiences! Well, it was a full hour after sunrise before I accidentally reached the hide -from the wrong direction! After the first close inspection, I realized why my friend had warned me against that hide. Although the platform was about 3 ½ - 4 m above the ground with a beautiful view of the water trough, about 40m away, the contraption was, well, let's just say lopsided, weather beaten and totally unsafe. No problem, I was wearing good cammo so I decided to conceal myself at ground level behind some Naboom trees and only peek out now and again. No Impala would notice me on the far side of the Naboom tree and other low shrub. I’d just settled in, when I heard the familiar ‘tjikk, tjikk’ of a flock of guinea fowl slowly coming in to drink their morning fill in the spill-over water that formed small puddles where warthogs have their mud baths. Well, I thought, ‘real bow hunters’ are nature lovers as well, and this was an unexpected opportunity to observe the antics of these spotted game birds with their funny ‘helmets’ from up close, as they would have to pass me at about 10 m.
Sitting very quietly, my cammo perfectly blending in with the tree trunk behind me, a low shrub in front of me and the shade patches completing my deception, I grinned in anticipation at my own cleverness, and the story I was going to tell my friend that evening around the campfire. After about 15 minutes the guinea fowl flock of 40-50 birds suddenly stopped dead in their tracks about 35m from me and became very quiet. I wondered whether they had spotted something at the water behind me, and burned to look around at the water trough. I used all my ‘will power’ and sat motionless. All at once all of them flew away with a deafening ‘tjrrrr, tjrrrr’ noise. Until today I’m convinced that a guinea fowl’s sharp eyes can not only distinguish form and outline, but can definitely identify colour as well, because I’m sure I hadn’t moved a muscle! decided that hiding at ground level under the Naboom trees was not conducive to ambush hunting after all, as other birds and animals would soon come in to drink too and would probably also spot me. Why take the chance? In any case,‘real hunters’ are not afraid of a little danger like falling through the floor of an old wooden blind. What are some spiders, scorpions or even a little snake now and then up there amongst the treetops to us? It took me some time and a considerable amount of my ‘real hunter bravery’ to scale those rotten beams up to the platform! Well as long as I was not moving, the whole contraption wouldn’t sway like a leaf in the wind. So I sat as quiet as a Sunday school child wanting to earn a sweet. Twice during the morning I saw warthogs coming in to drink and to take a mud bath, but I was after an Impala ram. Once I even distinctly heard the bark of a kudu in the distance that most probably got a whiff of me. Numerous beautiful birds came to drink water and sat in the tree tops surrounding me. I thought that maybe a ‘real hunter’ would at least have brought his bird book to try and identify some of the more uncommon ones. At 14H15 I suddenly spotted an impala to my left. Slowly, more impala materialized out of the dense bush, and cautiously neared the water, noses constantly testing the air, ears twitching nonstop trying to pick up any unfamiliar sound. This was the moment of proof for me as a real bow hunter! Surprised I realized that I was shivering with buck fever! I have been an experienced rifle and handgun hunter for many years, and have experienced this for over 30 years! Slowly I got up, careful not to rock the stand blind. I knocked the arrow and drew the bow. Calming myself, I concentrated on the kissing button next to my mouth, the peep sight and pin steady. Waiting…waiting, a big ram passed in front and below me, not 25m away. Waiting until he was next to me… surely he was mine! Too late I realized that in the final second before I touched the trigger release, by mistake I’d over pulled the arrow by another inch, the arrow slipped past the arrow rest and the knock pulled out of the bow string. With a clatter the arrow tumbled down and stuck in the ground, startling an impala that at that stage was right under my stand! Involuntarily and dumbfounded I leaned over to look in utter astonishment at the arrow below me. Suddenly the old timber structure started creaking and splintering. As I was starting to lose my balance, I dropped the bow like a hot potato and frantically tried to grab onto a nearby beam, with rotten planks and timber falling all around me. Luckily, I could break my fall to the ground by grasping on to some other beams as well on the way down. Nevertheless, I still received a few nasty scratches and bruises by the time I reached the ground. The impala were long gone by that time, and I’d dented all four my spare arrows in the fall, so this hunt was effectively over. I counted my lucky stars that I had not been more seriously injured. Disappointed and disgusted with my own stupidity at a golden opportunity lost, I slogged along back to camp with quite a different story to tell than the one I hoped for! Well, it’s the hunt and not the kill that matters, and the Bushveld sunset on the way was just something unbelievable! 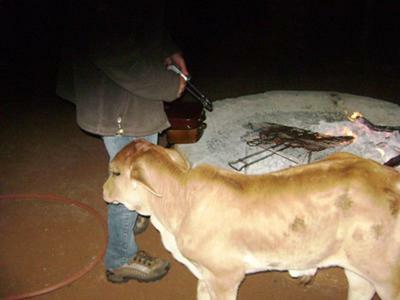 When I reached the campsite well after dark, my friend cheerfully greeted me, T-Bones sizzling on the fire, and in company of, can you believe it, his pet orphan breeding bull calf ‘Steve’! The calf followed him everywhere like a faithful dog, and it even enjoyed the heat of the fire in the cold winter night as much as we did! What he is going to do with ‘Steve’ once it is fully grown, I really don’t know! The companionship of a good friend, a warm camp fire and a story to tell, what a fitting end to a most enjoyably and eventful day! Now, isn’t that what hunting is all about, after all? Comments for Impala bow hunt with Mr.Murphy!